The carburation process in modern diesel engines practically begins with the moment of fuel injection in into the cylinder, and ends at the same time as the combustion process. The improvement and development of the carburation process depend on the injection parameters, particularly on: the motion of charge in the combustion chamber; fuel properties; combustion chamber sizes; a surface temperature; interdependent motion of charge and fuel. With a view to carburation in diesel engines, we obtain a nonhomogeneous mixture in diesel engines. First of all, the internal carburation process cannot ensure uniform distribution of the injected fuel’s steam and air. Besides, the improvement of carburation process is impeded by fact that as a result of the combustion process development there occur the fuel injection and carburation that increases that amount of fuel, which is burnt in the expansion line. All this causes increasing thermal heat losses and growing amount of toxic substances in exhaust emissions. Also, the improvement and efficiency largely depends on the length of self-ignition impeding period that directly defines the engine’s dynamic magnification factor. The paper dwells also on the possibilities of partial eradication of negative phenomena and increasing the engine’s efficiency, as well as reducing toxicity. In the engine’s intake system, the electric injector is inserted, by means of which, at the beginning of the intake process, there is carried out the injection of a certain amount of fuel in front of the inlet valve, and together with the air coming into the cylinder it creates the mixture, which occurs during the filling and compression process, and at the end of the compression process, the main amount of fuel is atomized by means of basic injector. By the end of the compression process, until the fuel is atomized from the basic injector, we have the depleted, but almost homogenous mixture, and therefore, this mixture is uniformly distributed in the combustion chamber. At the same time, the primary oxides, to a certain extent, are created for starting combustion. Immediately after the fuel atomizing from the basic injector, we will obtain the mixture required for combustion, and the combustion process begins earlier than during the process of the creation of a standard mixture, and this means that the length of self-ignition impeding period reduces, and consequently the efficiency goes up, and the amount of soot in exhaust emissions is reduced. Relationships that are the subject of logistics in general, in principle have still not been resolved from a juridical standpoint. Even individual types of logistics do not have holistic, integrated legal regulation. However, even the legal regulation of the transport logistics is a fragmented set of norms regulating individual types of transportation, but not a transport logistics in general. It is hard to imagine that in principle it is possible to develop a set of international legal standards, which would constitute a coherent legal system ensuring the functioning of macro-logistics systems, i.e. the so-called “the international logistics right" or "the right of international logistics systems”. International practice is on the way of the development of legal regulation of individual logistics operations, but not of the logistics in general. Many of the logistics spheres are not regulated by international law even on that level. Moreover, a large number of logistics operations is not regulated, even at the level of national law. Management of the goods distribution process, from the legal point of view, is one of the most “non-image” fields of economic activities. There are adopted many international agreements in the field of international goods distribution (especially in the field of transport and customs regulation). However, majority of these agreements have hardly representative character (many of them, which are adopted quite a long time ago, still await either entry into force, because they do not have the required number of ratifications). International trade interests, the process of international division of labor, and the internationalization of economic life have created a special tool of legal regulation – "Lex mercatoria" (international commercial law). Drivers of road-building machinery are subjected to noise pollution variable nature of the noise. The purpose of this study is to show the values of noise experienced by drivers of different types of road-building machinery (trucks, excavators, tractors). This paper introduces cycle dynamic model of combined tractors – trailer with mounted damper against sudden bend in order to increase stability when turning round. The research results can make rational basis for selection of appropriate parameters of the damper. Development of automatic, robotic and computer science has lead to development of wide range special motors (micro motors) which have large application and are interesting for research purposes. One of them is single phase shaded pole motor having a wide application in large number of household devices. Motor performance characteristics are analyzed using method of symmetrical components. For research purposes motor mathematical model is developed enabling prediction of motor operational characteristics. Obtained results are compared with experimental ones. Motor dynamic characteristics are obtained by building the simulation model in MATLAB/SIMULINK. Adequate conclusion regarding accuracy of developed motor models is derived. Finite Element Method has been proved as valuable tool for solving different electromagnetic problems inside electrical machines. Calculation of magnetic flux density and its distribution in machine cross-section is difficult to be calculated by analytical methods. Therefore Finite Element Method is implemented for solving set off Maxwell equation which enables precise calculation of electromagnetic field and magnetic flux density in three different electrical machines: three phase squirrel cage motor type 5AZ801-4 prodct of company Rade Koncar, three phase distribution transformer type product of company EMO, and single phase capacitor motor FMR-35/6 product of company MikronTech. Distribution of magnetic flux density in all three machines is calculated for different operating regimes. The analysis of two-layer sheet bending moment package under plane strain conditions, taking into account the strain hardening. Approximate analytical dependence for the largest radial compressive stress and the relative displacement of the radius of the neutral surface of the inner layer. The possibility of increasing the permissible degree of deformation and reduce the relative radius of curvature of the inner layer. The paper deals with an experimental measurement of the fatigue operating life of a specimen from the aluminium AlMgSi07 alloy on a built testing equipment, into which the welded joint was implemented. An importance of the measurement is in a comparison of achieved results with the same material, which was not subjected to welding. The result of the research is verification of the influence of welding on the fatigue operating life of the concrete material at torsion stress. 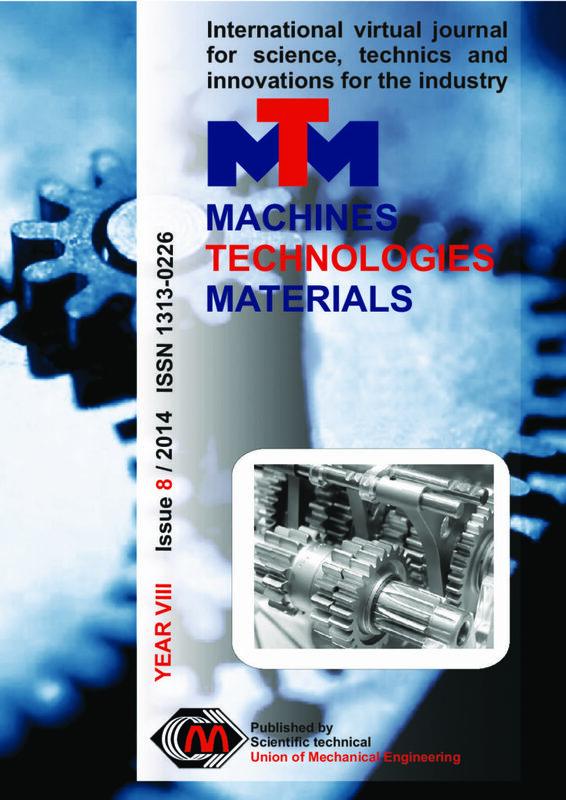 The article presenting a results about dynamics of moment and coefficient of friction change is established by experimental research of applied layers upon steel parts through vibrating gas metal arc overlaying process with increased wire electrode vibrating frequency. It was established that increasing of the vibrating frequency at rate of 150 Hz leading to significantly shorter time for interaction of both surfaces to obtain a process of established wear. Integrated technology and new generation of multimodule tracked vehicles unit was designed by PIMR- Industrial Institute of Agricultural Engineering in Poznan within the research project WND-POIG.01.03.01-00-164/09. The Tracked Vehicles Unit (TVU) was built as a part of cooperation with Polish firm Hydromega. TVU is dedicated to work on wetlands and should have positive impact on ecology and better environment protection thanks to use of biodegradable oils and lubricants, diesel engine with Stage III emission standard, innovative tracks which have different internal and external speeds during turns. A single-phase technology is designed for harvesting/collecting and transporting biomass (reeds, grass, bushes, small trees) on wetlands, especially these that are located in National Parks and Nature 2000 areas. The TVU is designed to work with different tool modules for cutting, shredding and transporting collected biomass on wetlands. Amphibian type of the TVU’s hulls allows for work in inlands water (rivers, lakes, canals). Over the past several years, reliability has become an increasingly important topic when it comes to continuous improvement. Higher engine reliability reduces repair costs, and contributes to increased performance. In addition, it increases safety and reduces potentially serious failures. This paper presents an evaluation and comparative analysis of the reliability of two different types of electronic fuel control systems – Common rail and Epic Lucas using the Pareto method. Their most common failures and repairs costs are identified and present in diagrams.